The Moi is the newest addition to the Kazuma kiteboard line. The Moi was created by Matt Kinoshita and Cyril Costa specifically for light wind conditions that Kazuma riders find in France. The lower entry and exit rocker gets up to speed instantly and stays on the water when most other boards sink and plow. 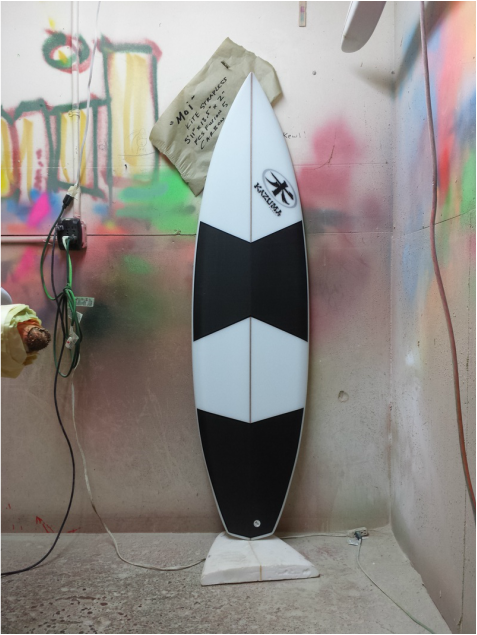 The effortless glide allows you to take advantage of any swell or chop and works well in the worst conditions. Like all Kazuma kiteboards, Matt shapes in his trademark concave deck which offers multiple advantages over a traditional domed deck. Concave decks make the board stronger, lighter and allow for a more surfing rail shape at a lower volume. Concave decks allow more flex into the board which absorbs the chatter and gives amazing spring out of your turns. Last, the concave deck allows the riders weight to be closer to the surface of the water for a much more solid, stable feeling you have to experience to believe. Matt’s signature Triple Barrel concave tops off this Magical design and gives you crazy performance and that true surfing feel.